Go ahead and pick up your pictures down at the track photographer’s office. To get to the office, go down the stairs next to Phyllis the Nut Lady by the gift shop in the grandstand. Go through the doors at the bottom of the stairs and take a right, then another right. Go down the hall about 200 feet and they are to the right. There are signs down there as well. The photos are $10 and exact change is GREATLY appreciated. Conformation and Pedigree Clinic – Saturday, August 1st at 10:00 a.m.
Join us at Canterbury Park as Conor Foley, http://www.oraclebloodstock.com, joins the MTA for this educational seminar! We will have several horses on hand and there’s no better way to learn about conformation than to see it explained using an actual horse! There’s always something to learn and more than one way to look at things! RSVP by calling 952-233-4802 or emailing kay@minnesotabred.com to save your up close seat to this exciting seminar! You are all welcome to attend! There will be a change in the photo distribution. They will NOT be available in the gift shop this year. I have asked the track photographer if we wants us to go down to him or if he would like Heather to pick up and distribute. We will hopefully find out this before we get to the track tonight which way we’re going to go – either way they will be available for $10 either way this evening. I was hoping I would have an answer prior to this post but I will update accordingly. I’ll also throw it out there on the Twitter feed when I know for sure. Here are some photos of TENS victory – just so we can keep reliving it for a while longer! He’s doing well. CITRON KID is also doing well and we’ll look to enter for next weekend later in the week. TENS WILD and his groom, Felix, coming to the paddock before the race. 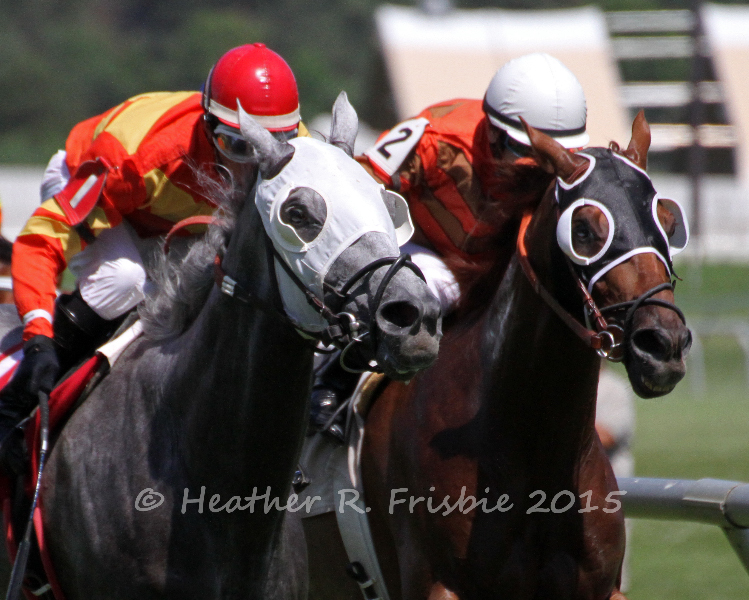 TENS making his move under Dean Butler. Below is the financial statement thus far. We only have one month with a horse so there is not a lot here yet: we don’t have a vet bill yet, but we do have Clay’s bill. The only items added for July are the claim for CITRON KID and the purse money from TENS races. In other news, we were back in the barn when TENS came back. He was still pretty warm and it took him a while to pee for his test, but he looked good. He was a little keyed up still, but that’s to be expected after a race. He’ll walk for a few more days and then he’ll head back to the track for jogging and galloping. 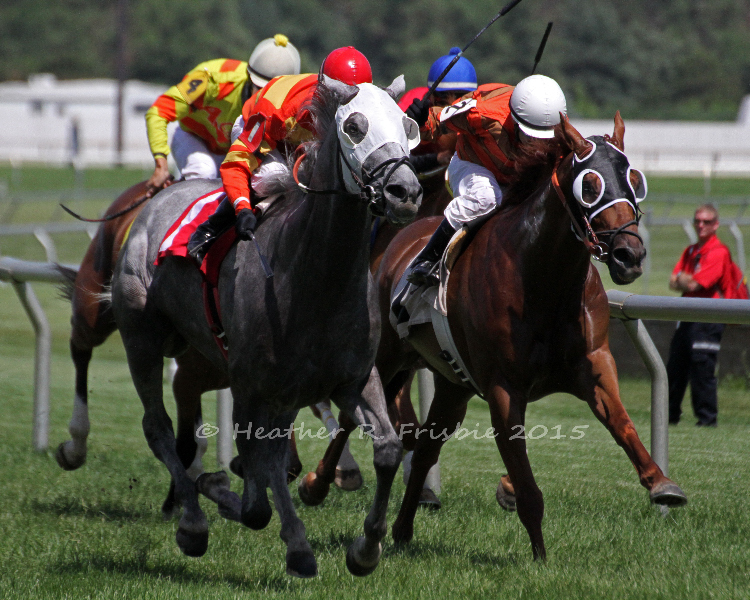 Nice win by our boy TENS WILD today under Dean Butler. Though we trailed the field early it was a closely bunched group and Dean knew exactly what he had underneath him. As the field moved through the far turn and Dean steered TENS from 6th to 3rd while getting him in the best position to make a run to the wire, I felt confident that we had it. Very exciting to get that first win and congratulations to everyone. Big thank you to Clay, Juan, Felix and Dean for getting him ready and getting him home in front. We will run pictures the same way we did last year: they can be picked up in the gift shop and will be $10 each. I placed an order for an initial run of 50. Last year we did 40 and then needed reorders for 10 twice. We have less people this year so I thought I’d give it a shot at 50 and see what we can do. If we end up needing more, we will reorder. The photos should be ready for Thursday night, but most definitely by next weekend. It looks like we’re going to look to give TENS about 3 weeks off and bring him back right at this level. CITRON KID is doing well and we’ll be looking to enter him the weekend of August 8-9. We’ll have another post up this week and add some pictures that Heather was able to take of our boy out on the track. We will have a pod reserved in Silks tomorrow for the Canterbury Racing Club as TENS WILD heads to post in the 6th race. 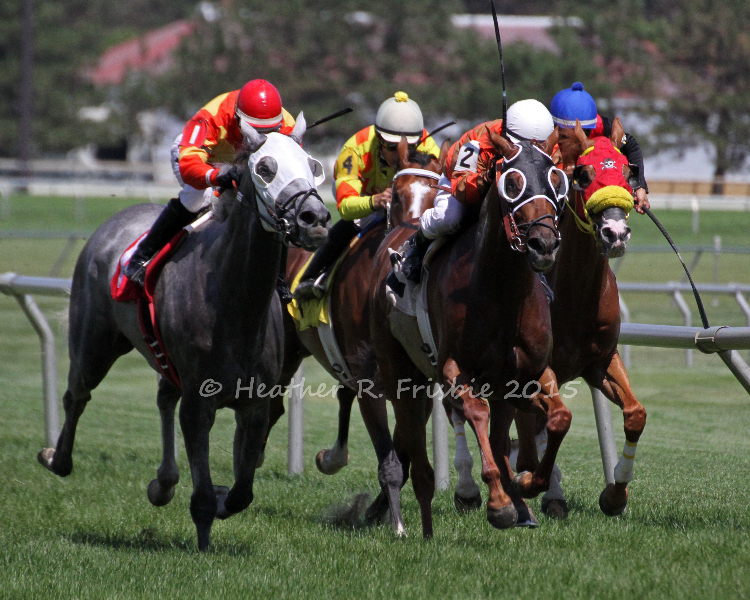 The race is a $16,000 claiming race over the grass going 7 1/2 furlongs. 2 – Gentle as a Breeze (Berndt/Escobar): Lots of speed in this guy who had a tremendous race two back demolishing a $10,000 claiming field by 11 1/4 in an off the turf mile event. Just missed a few times over the Phoenix turf but the make up here is much different (see MUNDY 2-years ago). 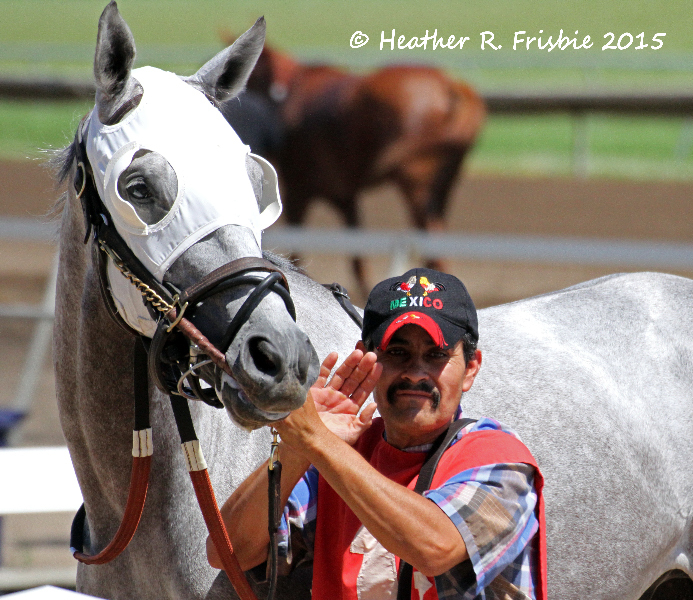 He tended to rate a bit better at Turf Paradise but that was also for his former barn. 3 – Mr. Mischief (Granitz/Goncalves): Solid turfer likes to go a bit quick early as well. Finished ahead of us 2-starts back but that’s when TENS was getting a bit worked up in the paddock. 4 – Hunterwood (Biehler/Velazquez): Steady runner finished well in both Canterbury turf appearances but finished behind TENS in his last. 5 – Go Gold (Westermann/Sanchez): Likes to come off the pace and should have plenty of pace to run at. Tries turf for the second time in his career and going perhaps a bit longer than he likes. 6 – Unsaddled Glory (Donlin/Richard): Pulled up and vanned off last out, it’s amazing how many of these type come back to win. Finished a solid 3rd two back in a $20,000 claimer and like to flash early speed. It’s small field and we have a new pilot on board, leading rider Dean Butler. For a 7 1/2 furlong race there is an awful lot of early speed in there. You’d almost think that we were part of it – and we can be (see last race) – but I don’t think we have to be. The shape of the race looks like it is going to set up like TENS win when we claimed him – tuck in behind the speed and then a solid run to the finish. If it works out this way, I think we have a very good chance of winning this one. Clay has schooled TENS the paddock a few times again this week and with the heat and humidity forecasted tomorrow, it’s important that he’s nice and relaxed. Clay has done all he can and our boy is ready. We’ll see you in Silks and paddock group 3 will lead the way to victory!